Preface. M. Schminke, M. Priesemuth, Management and Ethics: Revisiting Distant Neighbors. Part 1. Ethics from the Top Down. R. Cropanzano, F.O. Walumbwa, Moral Leadership: A Short Primer on Competing Perspectives. R. Chun, Organizational Virtue, CSR, and Performance. D. Rupp, C.A. Williams, R.V. Aguilera, Increasing Corporate Social Responsibility Through Stakeholder Value Internalization (and the Catalyzing Effect of New Governance): An Application of Organizational Justice, Self-Determination, and Social Influence Theories. M.S. Mitchell, N.F. 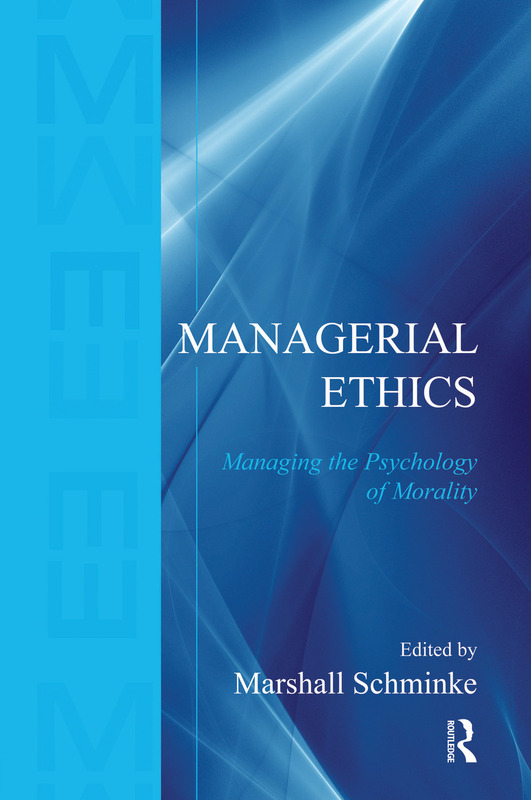 Palmer, The Managerial Relevance of Ethical Efficacy. Part 2. Unethical Behavior: Causes, Consequences, and Comebacks. D. De Cremer, On the Psychology of Preventing and Dealing with Ethical Failures: A Behavioral Ethics Approach. E.E. Umphress, J.T. Campbell, J.B. Bingham, Paved with Good Intentions: Unethical Behavior Conducted to Benefit the Organization, Coworkers, and Customers. R.L. Hess, Failures, Losses, and Fairness: The Customer's Perspective. L.K. Treviño, G.R. Weaver, Advances in Research on Punishment in Organizations: Descriptive and Normative Perspectives. Part 3. New Theoretical Perspectives. R. Folger, R. Cropanzano, Social Hierarchies and the Evolution of Moral Emotions. M.E. Price, Free Riders as a Blind Spot of Equity Theory: An Evolutionary Correction. D.M. Mayer, From Proscriptions to Prescriptions: A Call for Including Prosocial Behavior in Behavioral Ethics. M. Schminke, A. Vestal, J. Caldwell, A Review and Assessment of Ethical Decision Making Models: Is a Garbage Can Approach the Answer? Marshall Schminke has a PhD from Carnegie Mellon in Industrial Administration and Organizational Theory. He is presently Professor of Management at University of Central Florida. He teaches Organizational Behavior, Organization Theory and Design, Leadership and Business Ethics. He and his wife Maureen Ambrose attend SIOP each year, and do research in the area of overall justice judgements in organizational research. He is (2006-present) the Associate Editor of Business Ethics Quarterly and is on the Editorial Board of the Journal of Management (2005-present).